Huawei 4D Touch can prove to be an out-of-the-box technology for its users. We expect that this astonishing technology will be found in its upcoming Mate 10. Seems like, Huawei has taken up the entire responsibility to introduce new features to its gadgets. It was the first smartphone company to add 3D technology to its smartphones in 2015. And in 2017, it has done something similar yet again. 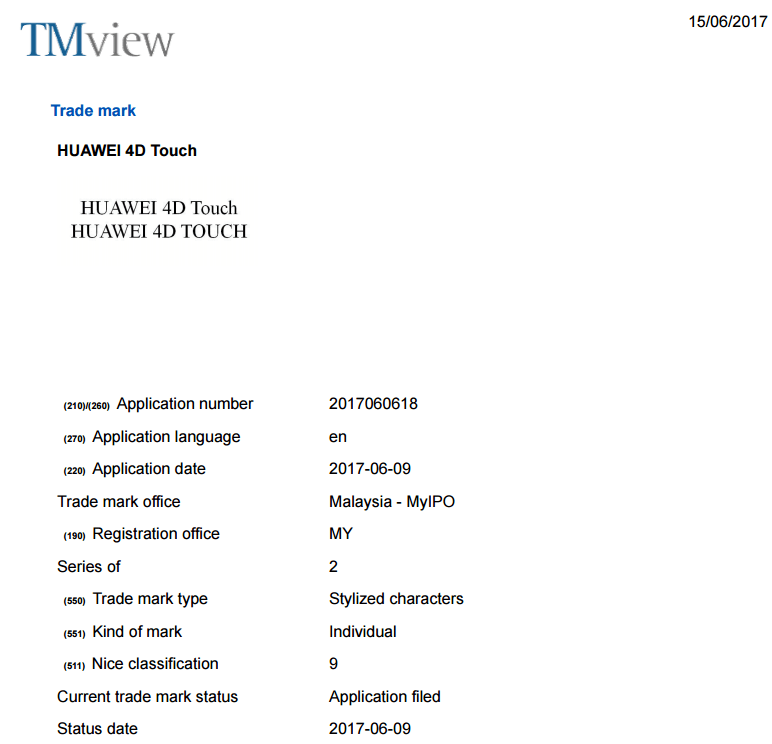 It filed a trademark known as Huawei 4D Touch on 9th June, 2017. The application number of the trademark is 2017060618. The application for the trademark took place at MyIPO office, Malaysia. As the status of the trademark shows ‘Application Filed’, it states that the concerned authorities still have to approve the requested application. Also, the newly launched Honor 9 showcases 5.15-inch Full HD display, 3200mAh battery, 6GB RAM, etc. It has covered all the loopholes present in Honor 8, and has further included a dual rear camera setup of 20MP for offering extraordinary picture quality to its users. As per the sources, Huawei will launch its upcoming model ‘Mate 10’ either at the end of 2017, or at the starting of 2018. And we believe that Huawei 4D Touch technology will be seen in this gadget.